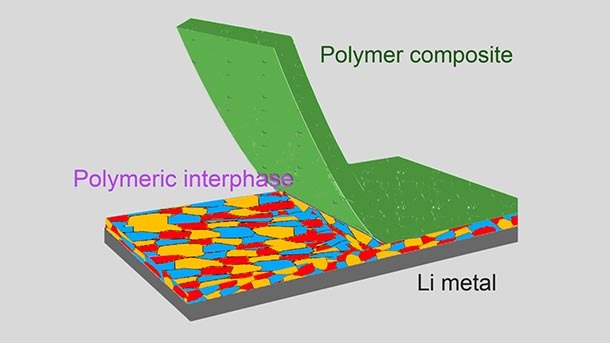 UNIVERSITY PARK, Pa. – Rechargeable lithium metal batteries with increased energy density, performance, and safety may be possible with a newly-developed solid-electrolyte interphase (SEI), according to Penn State researchers. As the demand for higher energy density lithium metal batteries increases — for electric vehicles, smartphones, and drones — stability of the SEI has been a critical issue halting their advancement because a salt layer on the surface of the battery's lithium electrode insulates it and conducts lithium ions. One of the least understood components of lithium metal batteries, the degradation of the SEI contributes to the development of dendrites, which are needle-like formations that grow from the lithium electrode of the battery and negatively affect performance and safety. The researchers published their approach to this problem today (March 11) in Nature Materials.